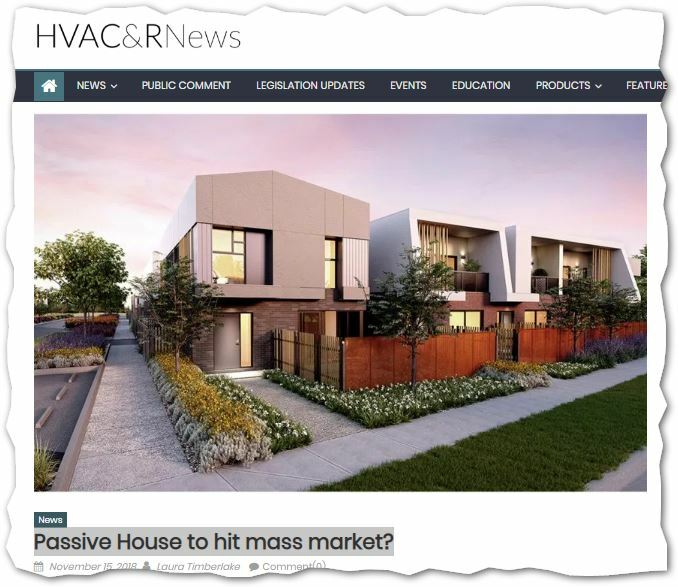 15 November 2018 HVAC&R News’ Laura Timberlake: Passive House to hit mass market? | Sustainable Engineering Ltd.
Library 15 November 2018 HVAC&R News' Laura Timberlake: Passive House to hit mass market? Frasers Property Australia is the first mass market developer in all of Australia who’s looking forward to making passive houses through their in-house design team. They know the primary benefits to the occupants are health, well-being, lower ongoing energy costs, and of course, sustainability of the building and they believe they can sell those benefits to their clients. It’s interesting how in New Zealand, the primary drive of passive houses has been single family homes being build for motivated owners. In Australia, the passive house community has much more quickly switched over to the commercial/apartment/dorm scale of building. It’s especially interesting because Australia’s climate is even more mild than NZ requiring less heating than almost all of New Zealand’s climates; but yet they are adopting passive house on a larger scale much more quickly than New Zealand.